Why was the DoorStorm developed? 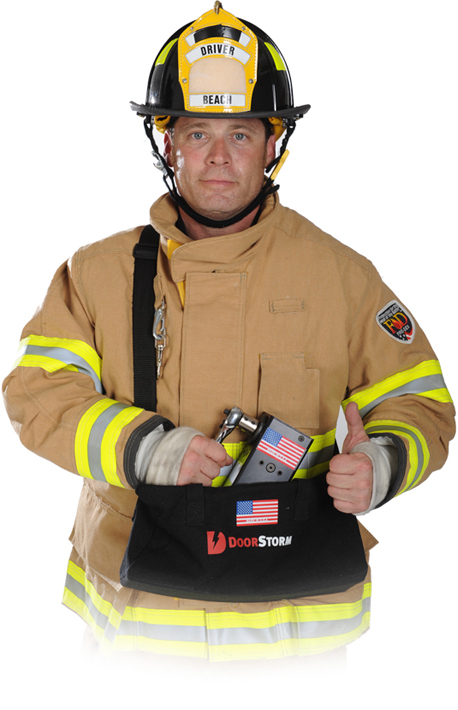 DoorStorm was developed due to the great need of our fire departments and law enforcement agencies for a mechanical door entry device that is light-weight, hand-held, maintenance-free and high-efficiency without any cumbersome hoses or oil-leaking hydraulic cylinders that need constant priming and exercising. What makes DoorStorm better than other units? DoorStorm has characteristics that no other unit offers. 100% hand-held - single operator use! 100% maintenance-free - No priming or exercising! No hoses --no hydraulics - no breakdowns! What is the overall size and weight of the units? How reliable are the units? The units are 100% USA-made to military specifications and high reliability standards, including our Zero Defects Program (ZeroDP). DoorStorm is currently under Patent Pending Protection in the U.S., and will have worldwide protection in over 167 countries this year. Where can I purchase these units? The units can only be purchased through our authorized nationwide distributors, as well as directly from our worldwide distributor in Palm Beach Gardens, Florida. Call today at 1-888-444-4656 for more information and to talk to one of our knowledgeable technical representatives. Who is most suited to use the DoorStorm units? Various municipalities such as fire departments, DEA, FBI, SWAT teams, Federal Marshals, training facilities, state and local police departments, military personnel will appreciate the effectiveness of the DoorStorm units. Why would SWAT teams use DoorStorm units? SWAT teams, as well as Federal Marshals, FBI and other government agencies, are accustomed to serving warrants and apprehending potential felons. Their job detail calls for entering various premises, often having to force open all kinds of doors (solid core doors, as well as steel, Calamine, hollow core and many others). Using DoorStorm, their entry becomes quiet, fast and efficient, eliminating the old, noisy methods of steel halogen bars, saws and very heavy door rams. Keeping our law enforcement personnel out of harm's way ultimately saves lives. Have the units been tested? DoorStorm units have been field-tested and approved for use in various departments of government, including fire departments, Federal Marshals, SWAT teams and others. What is your warranty on these products? DoorStorm Ultra and MAX have a five-year limited warranty. Please read our warranty. How long did it take to develop these products? Over 2 years of intense design and structural "Cimitron" engineering have been spent to make these products simply the best available anywhere! DoorStorm was a team effort. Our team of design & engineering personnel created a truly remarkable product.